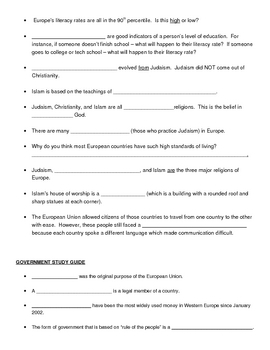 This is a nine page guided notes document over Europe. It covers all of the Modern Europe standards set by the state of Georgia. It goes with the PowerPoint "MODERN EUROPE STUDENT NOTE-TAKING POWERPOINT/PRESENTATION". 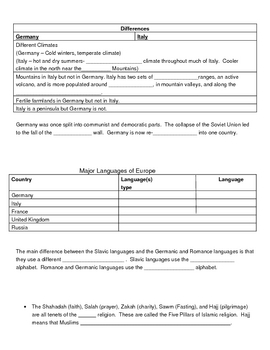 This is a great way to review or preview everything that students need to know about Europe including; geography, location, population, culture, religion, languages, governments, economics, trade. It could also be used by itself as a review, but the PowerPoint really reinforces the key concepts with great graphics and pictures.